Visitors to Coit Tower—if fortunate enough to visit on a clear day—will appreciate Telegraph Hill’s spectacular view of modern-day San Francisco. It is one that San Francisco’s early settlers not only appreciated but grew dependent upon, thanks to the small windmill-like structure that once sat atop Telegraph Hill. According to San Francisco pioneer and painter George Hennry Burgess, “for many years after [July 1849, the impending arrivals of] ships were signaled to the merchants of the little town, as they entered the Golden Gate,” by a semaphore system unique to the City by the Bay. The colorful story of Telegraph Hill actually began on July 9, 1846, when Captain John B. Montgomery of the U.S.S. Portsmouth, in defiance of Mexican rule, hoisted the U.S. flag at what is now San Francisco’s Portsmouth Square. The cautious captain subsequently “put up a signal pole on the hill off the point of Yerba Buena,” from which, on the 11th, a midshipman was able to forewarn him of an approaching warship. Much to Montgomery’s relief, it turned out to be the British frigate Juno—no threat to American occupation. 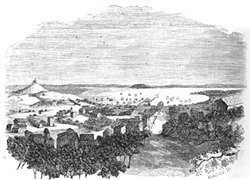 An effective strategic use had been found for the high hill—then called Loma Alta, now Telegraph Hill—and its panoramic view of the Golden Gate. By 1849, as nineteenth-century historian John S. Hittell describes it, “the urgent demand for the earliest possible information about the entrance of vessels into the harbor, a result of the rapid increase of commerce, and the large profits of the merchants, led in September [the date is not known] to the erection of a house on Telegraph Hill, for the purpose of making signals visible throughout the city. 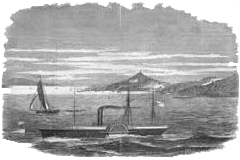 “A couple of arms, which could be raised or lowered at pleasure on a high pole, indicated by their position whether any water-craft was coming in at the Golden Gate, and, if so, what its character; if a steamer, whether a side-wheeler or screw steamer; if a sailing vessel, whether ship, brig, or schooner. On October 18, 1850, San Francisco learned of California’s statehood—albeit more than a month late since “stateside” news took that long to reach San Francisco by sea—from a historic message relayed from the approaching steamer Oregon to Telegraph Hill and, in turn, to the citizenry assembled at Yerba Buena Cove. Indeed, thanks to Telegraph Hill, the City’s celebration of California’s admission was in full swing long before the ship bearing the news had docked. In 1853, a second signal station was constructed at Point Lobos. The advent of the electric telegraph, however, would soon render San Francisco’s primitive but effective form of maritime communication obsolete. An amusing incident occurred in the gold rush days at San Francisco’s American Theater, during a performance of James Sheridan Knowles’s 1832 comedy, The Hunchback. “The play had progressed to where ‘Julia’ has quarreled with ‘Clifford,’ and ‘Master Walter,’ just hearing of it, comes in, all excitement, and walks to the centre of the stage. “The actor’s figure, dressed entirely in black, stood in bold relief against the white, flower-spotted scenery representing the drawing-room walls. “Throwing up his arms, long and black, he exclaimed, ‘What does this mean?’ ‘Side-wheel steamer,’ roared an immense voice from the gallery. – Art of the Gold Rush, Janice T. Driesbach, Harvey Jones, and Katherine Church Holland, 1998. – Montgomery and The Portsmouth, Fred Blackburn Rogers, 1958. – A History of the City of San Francisco and Incidentally of the State of California, John S. Hittell, 1878. – Men and Memories of San Francisco in the Spring of ’50, T.A. Barry and B.A. Patten, 1873. – The Annals of San Francisco, Frank Soulé, John H. Gihon, M.D., and James Nisbet, 1855. – Early San Francisco newspapers.